Wow, we finally hit Day 10 of Garden Tribe’s Vegetable Garden Boot Camp. Yay! Subject of today’s post–COMPOST. It almost doesn’t matter where you’re getting your information, it’s likely you’ll find this is one of the top recommendations for any garden, vegetable or otherwise: Use Compost! As I said in the post on Understanding Soil, “Feed the soil and the soil will feed the plants.” (That’s not exactly what I said, but who’s noticing?) And compost is soil food. The micro and macro-organisms that live in the soil subsist on what the rest of us throw out–at least the organic stuff we throw out. When the bacteria, fungi, mycorrhizae, pillbugs, earthworms, beetles (I could go on… and on…) feed themselves on the apple cores and tea bags, and garden debris, they cause decomposition over time. Which, when added to soil, continually foster a symbiotic relationship/activity with plant roots, allowing the roots to take up nutrients that would otherwise be unavailable to them. Compost also makes the environment more conducive to the presence and proliferation of all these beneficial community members, by permitting better aeration and better water retention. The compost actually improve the structure of the soil by allowing the soil particles (fine to coarse), along with the organic matter and the bacteria/fungi to clump together (aggregate) into larger, combination particles. I know that’s an awkward sentence, so just imagine the clay soil we read about yesterday (fine particles) retains its nutrient value, but also loosens up and permits better root expansion. The sandy soil (coarse particles) stays light with great drainage, but gains better nutrient and water retention value. Everybody’s happy! And since compost was once plant material, the nutrients and trace elements that went into the content of that plant material is now present in the compost. This includes not just “the big 3” NPK (Nitrogen, Phosphorus, Potassium), but Boron, Manganese, Molybdenum, Zinc, etc– elements we’ve hardly heard of, never mind remember they’re needed for plants to grow. Compost doesn’t have the amounts of these nutrients that you’d find in fertilizers, but because you’re using compost for more reasons than just fertilizing, you are using a much greater volume of material, so you still end up with an appropriate amount of most-maybe all- nutrients, and get lots more benefits besides. Bought this from the city a few years ago. Dimensions are about 40″ tall, 36″ largest diameter. Mix and water frequently, make sure you’ve got lots of browns for the amount of greens, and you’ll get your black gold. 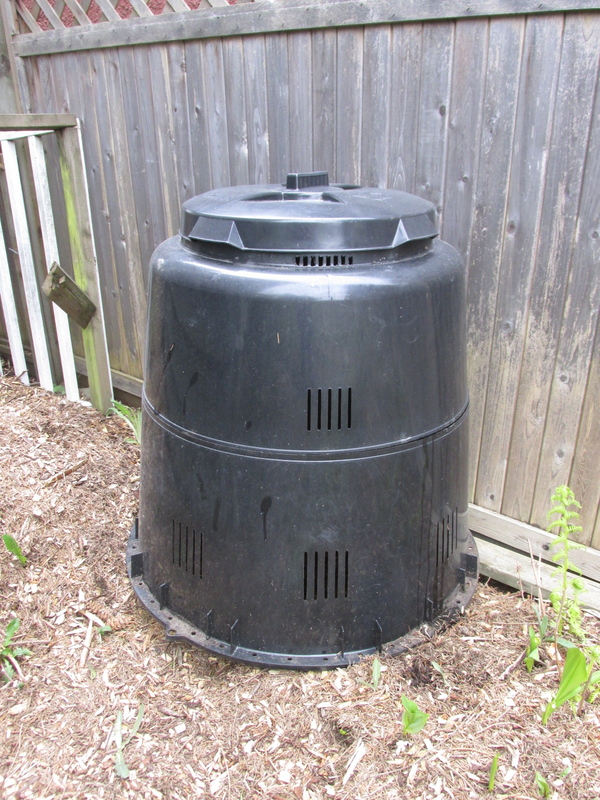 If you have two, you can fill the first and let it compost away while filling the second. So how do you make compost? All organic matter eventually decomposes. What you’re after is relatively rapid, controlled decomposition. The process is dependent on fuel and heat–just like a fire. The fuel is “green” material, or mainly nitrogen containing debris, and the heat is “brown”, or mainly carbon containing debris. The “green” can be any of your food scraps (preferably no grain products, and never any meat products, so that vermin will not consider your compost bin their local restaurant), and any garden material (except invasives or weed seeds, and probably not woody garden refuse–takes too long to break down). The “brown” can be fallen leaves, straw, shredded newspaper (inks and colours are vegetable-based products these days–happily). My usual practice is to wrap 2-3 cups of kitchen scraps in 2-3 sheets of newspaper, and throw that onto the pile. In the fall I collect as many bags of fallen leaves (from neighbours or trees down the street) as I can, and then add them to the compost bin through the year. You need a lot more brown than green, but when you do, you’ll see how fast it all shrinks down and begins that lovely process producing “black gold”. Important to the whole process is not letting pet micro-organisms die through lack of oxygen, or lack of water. Intermittently mixing the pile of material, layering greens and browns, and making sure there’s at least 3-4 times as much brown as green will keep it oxygen-rich. And locating the compost where it will receive enough rain, and turning the hose on the compost pile during dry spells will keep it moist enough (optimal moisture content described as a “wrung out sponge”– I’ve never tested my compost with bare hands to know that I’ve got the “right” moisture.). 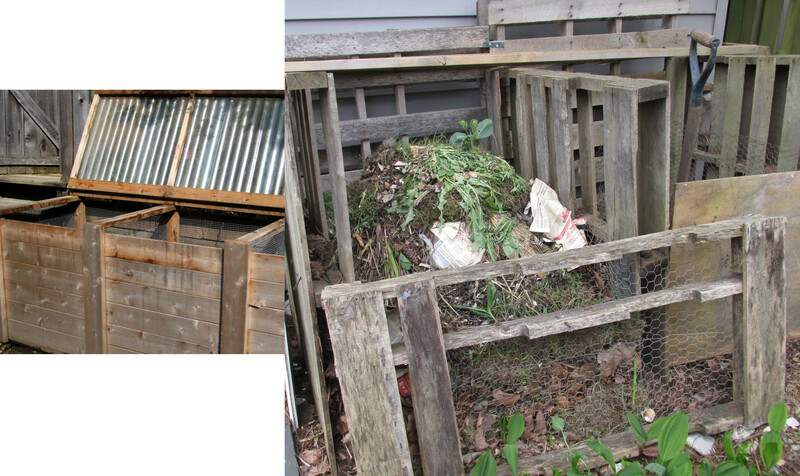 The compost bin on the left is the beautiful object featured in Boot Camp. The one on the right is mine! Not quite so beautiful, but it does the job, and it’s pretty hidden at the back of the garden beside the shed, under a big ol’ Douglas-fir. What do you expect from crappy palettes–which are never as pretty as Pinterest would lead you to believe. If you want to research this a little more, University of Illinois has a great little e-booklet called Composting for the homeowner that you might like to look at. Day 9 of Garden Tribes’ Boot Camp for novice gardens. Today it’s all about soil–what it is, what it isn’t, and how you make it work for you and your harvest. Before going any further you should know that if you are in a newly constructed house, the “material” surrounding the house may bear little resemblance to soil. Between the time the old house (or whatever) was removed and you moved into the new house, most of the site was probably changed significantly. You may even have the joy of finding MaDonald’s wrappers when you stick a shovel in the ground, or pieces of concrete, or great rocks that had to be either buried or disposed of some other way. So what is said about “soil” here may not actually relate to your situation. I suggest you dig a few good big holes in various not-too-conspicuous places to determine what is down there. As the expression goes, “Feed the soil, not the plants”. Soil is a complex structure of organic and inorganic things. The quality of soil is dependent on the size of the particles, the amount of air space around the particles, and the percentage of organic matter mixed in among the particles. Clay is the smallest particle of soil. The more clay, the denser the product, the less air space, the wetter, the heavier it is. But clay is wonderfully full of all the macro- and micro-nutrients and trace minerals needed for most plant growth, and is generally slightly alkaline. More on pH later. Sandy soil is the opposite: large particles, it holds on to little nutrient, but drains very well. Sandy soil is considered “light”–because it’s not heavy, since it doesn’t hold much water. Silt is mid-sized particle, easier to work with, but still doesn’t hold many nutrients. Every ground space has some combination of the above three materials. And once some organic matter is added you have loam–either clay loam, silty loam, or sandy loam. In coastal BC because of our rainy climate, some of the nutrients that contribute to the pH of soil get washed out of the reach of plant roots. So in general we have acidic soil here, which is why rhodos, azaleas, heather, oregon grape, and huckleberry do so well and are found in almost every garden. If you have any of these, and they thrive, you can be fairly confident your pH is acid. That’s not a bad thing (don’t think sulphuric acid here), in that more nutrients are available to plants in an acid environment than in an alkaline environment. So acid is better than alkaline. And if your pH is really low, then you can grow better blueberries than I can! Changing the pH of soil is pretty much a fool’s job. It takes several years of continual application of either a sulphur product (to acidify) or lime product (to alkalinize). Better to just appreciate what you have, and it you want to grow something that prefers a different pH, go with containers/raised beds. This is how many vegetables do well in acidic soil. The key to the good soil that you want to grow your plants in, is organic matter. Material that was once alive, when added to the soil, creates food for all the soil-based organisms that will increase the fertility of the soil. It’s those organisms that take the organic matter (last year’s banana peels and coffee grounds, or the sheep or mushroom manure, or Sea Soil…) and work on it to release the macronutrients (Nitrogen-Phosphorus-Potassium–NPK) and micro-nutrients (Mg, Ca, Fe, etc) that your plants need to grow and fruit. So the last thing you want to do is destroy the community of organisms that are doing the work of providing nutrition to your plants. You want to maintain the soil structure–not too much vigorous tilling, and certainly not every year. You want to avoid synthetic fast release fertilizers which can act almost like antibiotics against your beneficial bugs. And you want to continue to nurture them by giving them a supply of organic material ever year. Here’s a crappy little video on feeling the quality of soil, and the post that goes with it: the handful of soil sort of sticks together, so it has a little clay, is obviously not that heavy, and not very wet, and doesn’t have much organic matter–it looks pretty grey. Soil that sticks together nicely, but breaks up with just a hint of pressure. That’s loamy soil with organic matter (compost) mixed in.